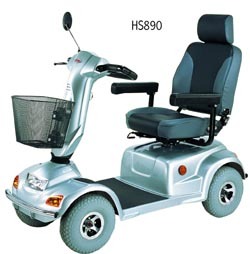 The New HS 890 4 wheel scooter - this rugged 4 wheel scooter was designed for those seeking an extremely durable terrain trekker loaded with the features available in the high end scooters of today at an affordable price. The 13" tires will cover rough terrain while the high back contoured seat, full light kit with directional blinkers and full swivel, sliding seat add all the creature comforts for travel! Smooth, sleek design in 4 wheel rugged durability. Top speed of 8 mph. ! Full light kit includes front light, tail lights and directional signals. 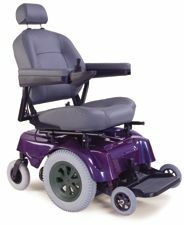 High back swivel and sliding seat. Front basket and rear view mirror included. Flip-up, width adjustable arm rests. Variable speed control knob..up to 8 mph! Motor Size 5300 rpm, 1000 watt.